My Nail Polish Diary: Wicked mani! "Pink goes good with green!" I used China Glaze Strawberry Fields and China Glaze Emerald Sparkle for my Wicked mani. They are the perfect (sparkly) representation of Glinda and Elphaba. Strawberry Fields is a bubble gum pink with golden shimmer, while Emerald Sparkle is a gorgeous emerald green with light green shimmer. I mean Hello gorgeous! China Glaze Strawberry Fields was released in the Summer Days collection from back in the summer of 2009, but I do believe it's core now. 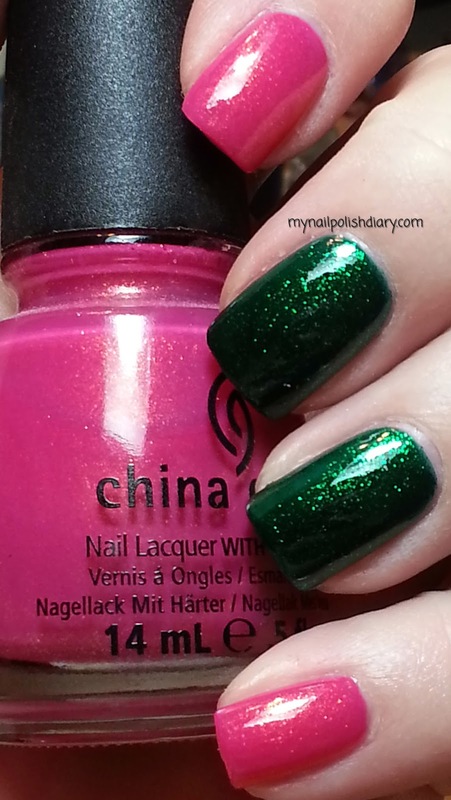 China Glaze Emerald Sparkle is even older released in the holiday of 2008 Sleight Ride collection. It might be HTF I'm not sure. It's one I'll never part with that's for sure! Wicked was awesome as always and DH and I had a great time. Kendra Kassebaum will always be my favorite Glinda and Idina Menzel my favorite Elphaba, but we've never seen a show that wasn't great.